While hiking and mountain biking, you can find several nature trails and lookout points at Prescott Park. Prescott Park starts from Roxy Ann Drive off of Hillcrest Road. The park totals 1740 acres of hiking and mountain biking trails, both paved and unpaved. This park is closed in rainy season and dry season. If the bottom gate is locked to vehicles you can still walk/hike into the park. Camping is not allowed. Option 1: Take the north I-5 exit (exit 30) and head north towards Crater Lake National Park on Hwy 62. At the second signal (about 1 mile from I-5) turn right on Delate Waters Road. Roxy Ann Peak is straight ahead at this point. Stay on Delta Waters until it ends (about 1.8 miles) at Foothill Rd and turn right. Go 1.3 miles to East McAndrews Road, go under the bridge and turn right on the clover leaf to go east on McAndrews. Option 2: Take the south I-5 exit (exit 27) and head east on Barnett Road. Stay on Barnett, pass the Rogue Valley Hospital, and at the signal at the intersection with Foothill Road, turn left (about 2.0 miles from I-5). Go 2 miles to East McAndrews Road, turn left before the bridge onto the clover leaf that will take you east on McAndrews Road. 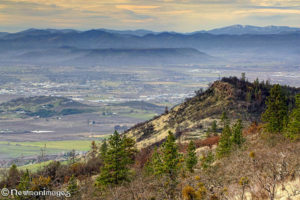 BEAR CREEK PARK is located at 1520 Siskiyou Boulevard; I-5 Exit 27. The park comprises approximately 110 acres and includes little league fields, an off-leash dog area, a BMX track, an outdoor performing amphitheater, a 25,000 square foot skatepark, a covered pavilion, various barbecue areas, four tennis courts, and two restroom facilities. It is also adjacent to the Bear Creek Greenway, a paved bike/pedestrian way which traverses northerly into Central Point and southerly into Ashland. Rogue Air Park is Southern Oregon’s only indoor trampoline park which provides 20,000 sq ft indoor activity area perfect for just about any age, shape or physical ability. Imagine the fun you can have with wall to wall trampolines, where you can play dodgeball, open court jump, tumble, launch to slam dunk basketballs and literally bounce off the walls. If your looking for a great place to have a unique birthday party, corporate event, family fun & fitness outing there is no place like Rogue Air. 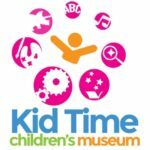 Kid Time is a nonprofit children’s discovery museum and early learning center in the heart of downtown Medford. Our focus is on kids 0 to 10 years old. We provide a rich and varied environment (exhibits, programs, preschool) for free-play along with both instructed and monitored activities that engage trained staff members with children and their families.